My last post was in May, as was my last layout. And then summer was here. My fair weather hiatus is over. I did keep up with reading the Counterfeit Kit Challenge Blog. Sometimes I even commented on it or one of the Design Team's posts. So here is an attempt to regroup and refocus on what I "ought" to be doing. First let me show you the inspiration for this month. 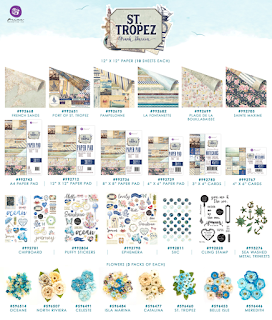 It is Prima Marketing's St. Tropez collection. While surf and sea themes don't work well with my lifestyle, the sun faded and weatherworn textures and colours in the kit are close to home. Needing a fresh start of inspiration and to get organized for two retreats coming up, the first thing I did was take my oldest kit off the shelf. 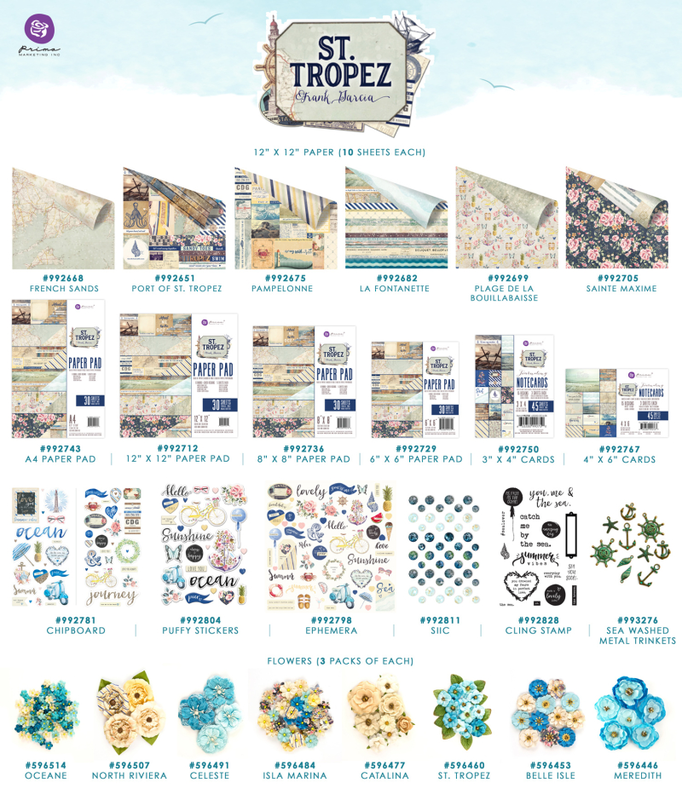 It was One Good Turn from Feb 2015 Pulled out the papers and embellies that would work with St. Tropez. The rest was refiled into the stash. Then with visual referencing of the St. Tropez line and the last of One Good Turn I raided the cardstock. Soft coral, aqua, and lemon. White, cream and navy. Added papers that reflected St. Tropez. Bo Bunnmy, Eire Wine Box. Pink Paislee, Daily Junque, map;.Theresa Collins, Memorabilia, snippits. A cloud in place of the tide and shore. Webster's pages, Your Life. Beautiful, a romantic vellum. WRMK Wildflower, Sketchbook for the floral. There is a blue and yellow stripe that I still want to add in, but it missed the photo. Simple Stories Vintage bliss, with all its weathered wood and soft colour pallet. Echo Park, For the Record 2, die cuts and alphas. CTMH Skylark Workshop on the go. This is where one of my stamps sets shown above, is from and if I hit a wall, I can always follow their "recipe sheets" to keep production going. Also included a few page kits that I made some time back. These are great to turn to when I need to look at some different colours. Now, I ought to get some recent photos organized and printed. A fresh start needs fresh stories. And so we have Oughtober!